We are heading towards the end of a big push to get all files in OneDrive or SharePoint. The Finance department (VIPs) are getting very frustrated with deleted files/folders reappearing as they are synced back online from other user's sycned client OneDrives (the name of the user and date/time are listed with the file online). PLEASE HELP. I am also opening a ticket. Checked SharePoint permissions. There are some unique permissions on a few documents but in general the members have edit permissions. Are you sure that those files were not opened on other users machines when they were deleted? Thanks for answering. No they were not opened but were synced. I opened a ticket with MS and have a call with them today. I will report back to here. Issue Definition: The Finance department (VIPs) are getting very frustrated with deleted files/folders reappearing as they are synced back online from other user's synced client OneDrives (the name of the user and date/time are listed with the file online). At this time, I do believe the issue has been resolved as I haven't heard any more complaints on this for about 3 weeks. Could You please give some feedback, what could be the actual reason of this problem? Did You figured this out finally? Best wishes! @Tarmo K. The problem did seem to go away. I'm not sure we actually figured out what the problem was. @Christine Stack, did we ever figure this out or did it just resolve itself? This issue did not go away. We delete folders and the continuously reappear over and over. I have tried the things outlined. Also - these folders are created because we made channels in Teams. I don't want this to happen!!!! I want channels separate from the folders created in Sharepoint. Are these alle Windows 10 clients? So, in other words exactly the same Onedrive clients? Windows 7/8 uses a different Onedrive client, even if you have downloaded the latest version. So I'd guess if you are using mixed Windows versions, this might give these sort of strange problems? In our experience - no difference unfortunately in client. Used only 8.1 and 10 clients in test environment. We noticed that changing "default" internet time NTP service refresh interval to custom setting and used same NTP time server made improvements, but we skipped further testing and closed environment before certain conclusion made. Using one only NTP server is another problem and time drifting was significant also within ~24-48h update interval. As we guessed Onedrive itself had no impact on problem, but we wait some more after next jump to testing. I have the same problem: reappearing folders and files after deleting them in Teams reappear after syncing the with the OneDrive sync client. I tried the following and that helped: deleted the files and folders in Teams, opened the channel with SharePoint and deleted the files and folders permanently from the Recycle Bin. The files did not reappear in the Windows Explorer and were removed from the OneDrive sync client. Make sure the Microsoft Account is VALIDATED on the computer from which the deletions are taking place. If you see something "You need to validate your microsoft account on this computer" that could be the problem. I had a user who was deleting files in a shared folder in OneDrive. I watched the files being restored from another computer by watching the OneDrive sync in real time. I had them Validate their account (text message or email) and after they did, the deletes are sticking. The files are no longer being restored. Well, this seemingly worked, for awhile, but no dice. Some of the photos we deleted still reappeared. Now the issue is seemingly random. Trying to nail it down. NOTE: Photos are being deleted through the Win10 native Photo app NOT through Explorer. Hi we have the same issue, someone delete's a folder in onedrive then it'll sync and re-appear, drives people insane. Everyone is on windows 10 with the latest version of onedrive. Sharepoint is online not on premis. NTP: we dont have a local NTP server but do not see time drift between machines. Having the same issue with a deleted document continuously reappearing from other users who have synced the library. We have not had this problem for a while now. Update Windows and the Onedrive syc client for all users who have access to the files. That seemed to fix it for us. Same thing happens if I delete the "Monthly" folder on the web. It simply comes straight back. Having battled with OneDrive on 50+ systems now, I really do have a pretty low opinion of the fundamental algorithms used. Log onto an old computer where you haven't synchronised for a while (like a few weeks maybe months) and that computer assumes it's the master version and restores files that you have deleted since. This has caused a BIG problem by restoring a script that I had deleted from one part of my command path, OneDrive restored the old version and I accidentally ended up running it. Ahh, I might have found this specific problem. OneDrive is synchronised in a VM and on my main PC. I was deleting it from the main PC so I tried to delete from my PC and for some reason there is access denied on one of the folders deep inside "Monthly". So what's happening is that OneDrive on my PC probably tries to delete the folder but fails due to this access denied and therefore restores it back. Big question, why access denied??? I'll reboot and have a look. After a reboot, the access denied had gone away and I was able to delete the old folders. BTW - also note that I user Dropbox and Google Drive as well. This problem has NEVER occurred with those two cloud systems - I can only assume because their synchronisation algorithms are better. 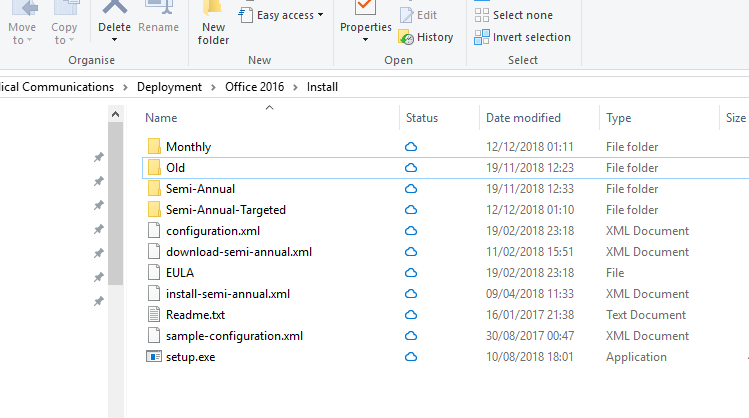 They must keep a much more robust history of deletions so that when you logon to an old computer, it knows that that "Monthly" folder was deleted afterwards and deletes (correctly) the copy on the old computer. It doesn't bring it back from the dead! Hi @Rob Nicholson - Can you explain a bit more on the root cause ? I was only temporarily able to solve this issue. Fortunately, thank goodness, it doesn't overwrite edited versions or delete anything. You do get the horrible "My file - LAPTOP046.ps1" cropping up where I assume it thinks it's got the latest version (it never has!) but there is a file there with a newer timestamp so it renames its (old) copy with the suffix and restores that. The creation of these files is usually my trigger to go into OneDrive and restore it back in time - a feature designed to Wannacry attacks but used because of this bug. I suspect, but a lot of guessing, that this is because OneDrive doesn't keep a transaction log kind of structure along side the actual folders and files. Therefore when you logon to an old computer, it has no idea that "Monthly" was deleted on another system many days later and merrily brings it back. Hence my observation that this is a fundamental flaw in the synchronisation algorithm used by OneDrive which Dropbox and Google Drive don't suffer from. They have a transaction log which they can refer to resolve issues like this. So the Microsoft programmers need to go back to the drawing board IMO... wearing my developer hat. I am flabbergasted that OneDrive has this fundamental flaw and they intend you to use it for business! Thank goodness that my clients only tend to logon to one computer at once! PS. The magically re-appearing folders just now when I tried to delete those incorrectly restored folders was due to some flaw in OneDrive on my PC and access permissions. Why it got into that state (access denied), I have no idea. But OneDrive has other flaws. For example, if you share out a folder to another user with read-only access (which I do with a set of PowerShell scripts), there have been examples whereby the sync engine thinks it's got a later version of the file and incorrectly creates a "New-User - LAPTOP034.ps1" version in the read-only folder. The problem is that because the folder is shared read-only, it is unable to upload it (too right) but then gets a red cross. And WORSE - because the file has been created in a read-only share, the permissions on that folder are set to DENY and are very difficult to get rid of. Fortunately, 7-ZIP manager when run in admin mode is very good at deleting stuff with bad security settings. Am I trying to create this in read-only share? Same here in the Free version of onedrive. This is the first issue I encountered and I resolve it by taking all clients offline, then remove the file/folder from every computer (including the copy on onedrive). Stupid but it works. It appears some file has been opened by a computer, therefore it reappears. I think a "OneDrive reset" on each computer would work? Please help me te delete organization in Teams free edition. Where do deleted messages and/or conversations go in Teams?